These picture are very pretty. They go with my decor perfectly. They are a fine quality and hang easily. I would definitely order them again. Morning Song -2 Piece Set 2 Custom Framed Prints. 100% and created to last. Individually printed and framed by hand to very high standards. Printed and inspected one at a time utilizing the latest archival UltraChrome Giclee inks Consisting of 2 Total Framed Pieces Each measuring 16''x16'' x .75'' deep Each Piece is Individually Framed Acrylic Glass Each piece includes hanging accessories and is ready to hang. You need only to apply an anchor to the wall of your choice. Can’t believe how cheap these pictures are. Plastic frame and not even glass over picture. I really like these pictures. It has shades of light and dark grey and various shades of blue in it and looks contemporary. 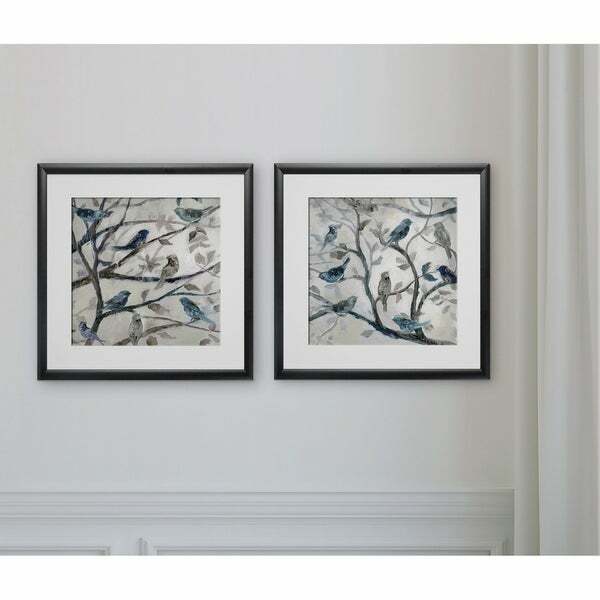 The birds are visible but subtle because of the abstract nature of the painting/print. Took one star off rating because the frames are kind of cheap (plastic) and have Plexiglas, not real glass. Would have preferred better quality frames but will do for now. Returning....for the price I expected wood frames and glass, not plastic frames and plexie glass.